Apples of Gold teaches about sexual purity through a powerful and sensitive parable about two sisters entrusted with a precious gift from the ruler of the land. When the governor's son returns, which young woman will be chosen to serve the prince--based on how the treasure has been protected and cherished? So begins the story of two sisters in a long-ago land who are presented with a precious gift. The governor wants the young women to protect and care for this gift until the return of his son, the prince of the land. Upon the prince’s return, one sister will be chosen to serve the prince according to how the gift was cared for–and both sisters will be surprised by what the prince wants to offer the one who best cherishes the gift. The young women have dreams of being happy and loved. But how they see the gift–and themselves–will determine how that gift is treasured and what will remain of their dreams. 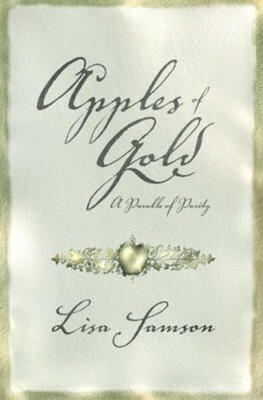 Apples of Gold is a powerful parable about the beauty of sexual purity and the prize that awaits those who are committed to the keeping of such a gift. Lisa Samson is the Christy award—winning author of sixteen novels, including the critically acclaimed Women’s Intuition and Tiger Lillie. Lisa, her husband, and their three children recently moved from suburban Baltimore to urban Lexington, Kentucky where they enjoy walking to the coffee shop, the library, and the park. Lisa speaks at writers’ conferences and has recently started a critique service to help other writers who wish to grow. Two sisters are given a precious gift by the Governor of the land. A gift they are instructed to care for and protect until his son, the prince, returns. One sister guards the gift carefully, understanding its value. The other sister flaunts the gift and allows others to abuse it. When the prince finally arrives and the sisters are called into his presence, they are surprised by the offer given to the sister who cherished the gift. 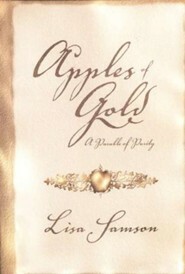 Apples of Gold is a fairytale a la George MacDonald, where each scene teaches more than one moral lesson. Lisa Samson spins a tale that warns young girls of the folly in not recognizing the beauty of sexual purity, truth, integrity, and steadfastness. This tale illustrates the rewards of self control and obedience without being preachy. –Diann Hunt, Author of RV There Yet? 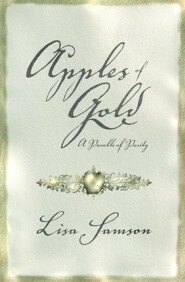 I'm the author/artist and I want to review Apples of Gold: A Parable of Purity - eBook.